In this blog I will explain Oracle Drop Ship Flow for R12i. In this blog I will explain the R12 Dataflow of Dropship order from OM to Oracle Payables. 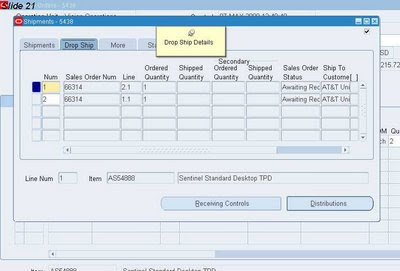 Drop Ship Sales order creation and booking. Since in Dropship we don’t receive the goods in our warehouse, SOURCE_TYPE will be “External”, where as for non-dropship orders it is Internal. Once Book, we cannot Changes SOURCE_TYPE. We can change the SOURCE_TYPE as “External” for an item at the time of order creation, or we can define it permanently in the Item creation Setup, by setting Default SO Source Type = External. Also as we don’t have any shipping activity in dropship orders, Receiving Transaction Processor (RTP) , triggered after Submitting the receipt will push the workflow from Shipping activity to Fulfillment. R12 Dataflow of Dropship order from OM to Oracle Payables. 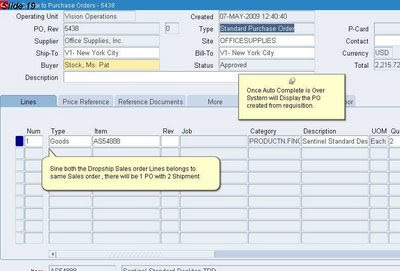 Step3 -Once order is Book, order line workflow will be at Purchase release Deferred Status . Step4 -Submit Workflow to progress the Order line workflow. 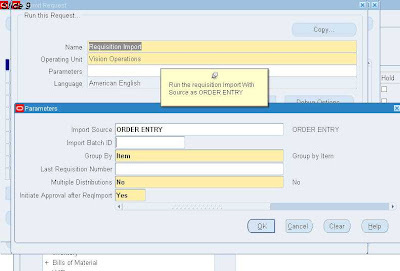 Step6 -Once requisition Import Completed successfully , Navigate to Order lines Action >Additional Information and then go to DropShip tab. 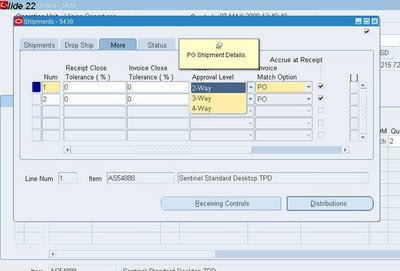 Step11 - Browse the Shipment Details of PO, (Shipment Button).We can select the Approval Level and Invoice Match Option based on your business requirements. 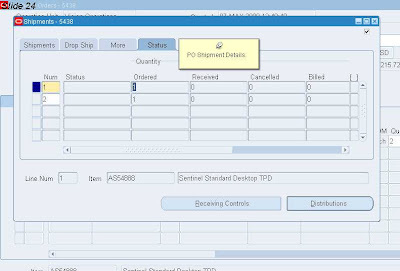 Step11 - Browse the Shipment Details of PO , (Shipment button). Step11 - Browse the Shipment Details of PO , (Shipment Button), it will display Qty Ordered/billed/shipped etc. 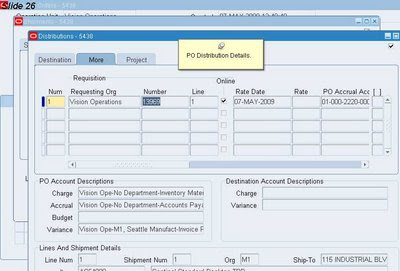 Step12 - Browse the Distribution Details of PO , (Distribution Button). Step13 - Navigate to receipts. 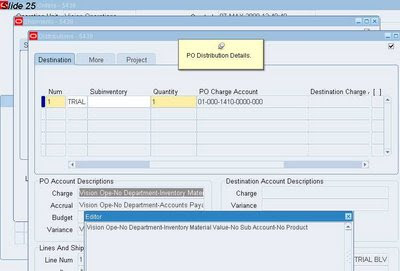 Step13 - Navigate to Receipt , system will prompt for Inventory Org , Select your Inventory Organization. Step14 - Enter Receipt against PO. Step15 - Once you save the Receipt , System will submit Receiving Transaction processor. 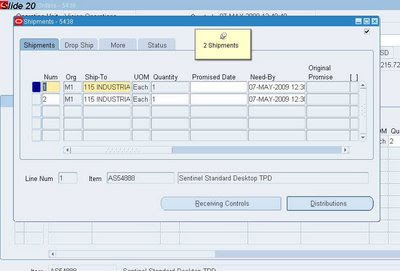 Step16 - RTP on successful completion Progress the OM Workflow and Line status change from Awaiting receipt to SHIPPED. websites are an open opportunity for every one. Thanks for this valuable document. Can give some idea about "Internal Drop Shipment". Drop shipping functionality enables you to take an order from your customer and fulfill it directly from your supplier's site. So when you say Internal , can you please provide some additional info about what you mean by "Internal Drop Shipment". Nice Blog.Thanx for the information. For External Line SSD = SAD , and we don't call ATP for external Sourced lines. I understand that ,lets say you as a customer service ,takes an order and you might want to give a SSD to your customers ,That should be a the date that your vendor ships from his dock ,Suppose his lead time is 2 days.then the SSD should be ordered date + 2 days ,assuming the PO is approved and sent to the vendor same date and he acknowledges the same date .Now ,supplier can have lead time for products ,can be based on his capacity etc .How do we calculate an exact SSD ? Can you please tell me how the return process will be handled for Drop Ship Orders (An Automated process) ? Good Question , let me get back to you on this. HI, thanks for this information. 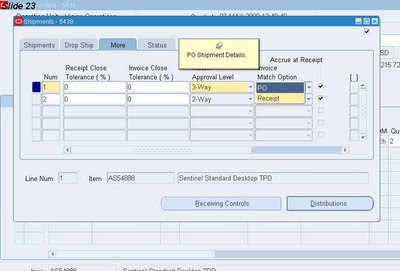 is it possible to have a Delivery Note (packing slip) generated even for a drop ship sales order? Normally this document is generated by the supplier when he ships the goods to the final customer. but in some cases, the supplier can also be a competitor, and we don't the name of the competitor to appear on the Delivery Note when customer receives the goods. If you don't required the rest 20 any more you can cancel the newly created line ( created after split).But if PO is already created for 50 then system will not let you cancel the new line because of seed processing constraint. Can you please hellp in understanding how the supplier will know where to ship the material in Drop Shipmemt. Since on the PO, I can see the Ship To location is of the organization creating the PO and not the end customer.